May is Oregon Wine Month, honoring wine made in an American state known for the Pinot Noir grown in its famous Willamette Valley, but richly textured by the other varietals -- Pinot Gris, Pinot Blanc, Gewürztraminer, Chardonnay among them -- and other regions such as the fabulous Umpqua Valley in the south. We're celebrating with four (ok, five) recommendations, and we've worked really hard to select different varietals because we think that any "wine month" highlighting a specific region is a great opportunity to try things you'd not have otherwise considered. Cheers! 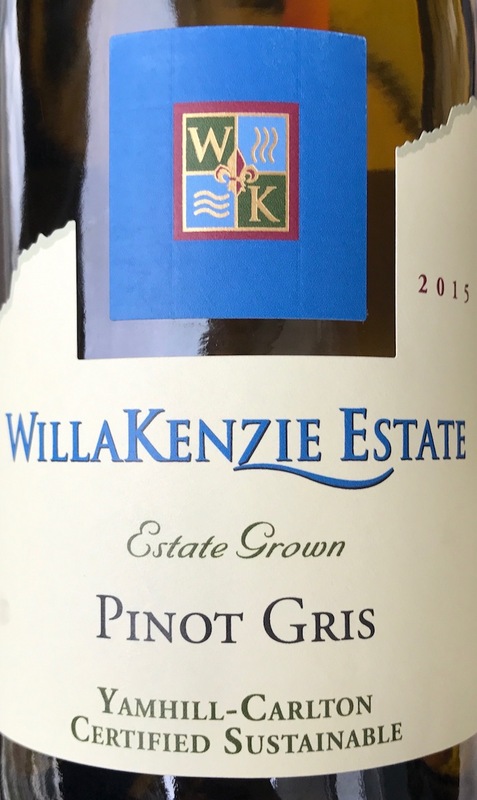 Pinot Gris is a white wine that has grown on me over the period of years, but is above all else intended to be fresh and well suited to spring and summer months. This particular wine delighted our senses, producing honeydew and cantaloupe notes in the nose as if we were slicing into a piece of fresh fruit. Layer citrus zest, some faint minerality, and… oh… the floral notes of jasmine and gardenia along with what (yes, I swear) was a bit of new soccer ball and you've suddenly poured something that is fun to talk about! You'll find some lemon and lime sprightliness in the front of the palate, with nice citric acid in the mid-palate that will cut nicely through a medium body pasta, a bit of green apple in the back, and lots of lovely floral notes from nose to finish. Delightful! Winemakers Adam Smith and Lauren Eisold produce some fabulous Pinot Noir and a great white blend called Edel, but we're sharing their Chardonnay in the interest of showcasing all that Oregon has to offer. They are some of the most passionate winemakers we know, and it shows in their relatively limited production lineup. Their 2013 Chardonnay offers unique balance and food oriented qualities. A far cry from the big buttery fruit bomb Chardonnays you'll find in the supermarket, Adam and Lauren age their Chard in neutral barrels to produce a mellow nose with a touch of insanely pleasing candle scent. Honeydew melon headlines a smooth, pleasantly creamy texture that never once feels overwhelming. This wine is meant for food! You'll find Umpqua Valley about three hours southwest of Portland, OR, south of the Willamette Valley. It's less well known than its northern neighbor, but produces beautiful and food friendly cool climate wine that is just as good. Sue and Terry Brandborg are a self-taught wine making couple that have built their Brandborg Vineyard and Winery in the tiny town of Elkton, OR, specializing in Pinot Noir and a lineup of other stunners. We are fascinated by the incredible wine coming out of such a relatively small vineyard: they have five acres planted out of sixty that are growable. Trying their Gewürztraminer in early 2016, we wrote that "We finished an amazing meal with the Gewurztraminer matched to poached pear, spiced pecans, and la tur cheese. The Gewurtz was pretty classic, showing a nose of crystallized sugar and crunchy honeycomb. Orange blossom came out in the palate, with some apple juice in the back of the mouth and citrus pecan pancake in the finish." We echo all of this opening our second bottle in March 2017, but we'd add that a year on there was a new grapefruit element that reminded us of Haribo candy. Soter Vineyards has produced a fine representative what we love about about great Pinot Noir from Oregon, tending to be cooler (i.e. less alcoholic "hotness" than California Pinots) but also substantively flavorful. In addition to the characteristic red fruit, we found some amazing notes of creamy chocolate, coffee, and smoke that finished just brilliantly when it went down. This wine is definitely hearty enough to pair with food, our choice being a bourbon glazed salmon and asparagus grilled outside and served over mashed potatoes. We said we were only doing four... but... We've long been a fan of the concept behind the Locations series of wines from around three world. From Dave Phinney, founder of the Orin Swift Cellars who have brought us (among other things) The Prisoner and Blindfold, comes this concept of sourcing from highly compelling vineyards in regions around the world in order to produce great wine representative of the given "Location". Oregon (OR) is a Pinot Noir with a subtle nose of candied red fruit. A roundly balanced palate doesn't cross the cranberry line, i.e. it maintains more of its cherry characteristic without drifting into the cranberry territory that some cooler climate Pinots often do. It's smooth on the tongue with a little soft tannin in the finish where nice marshmallow notes make it an excellent pair with sweet potatoes. This, like much other Oregon Pinot Noir, performs very well with food, and is a fine representative of the region.